Second Wave brings some oldschool challenge, a la carte. When playing XCOM: Enemy Unknown, there are many things that may cross your mind as you witness savage aliens eviscerating your beloved squad of experienced soldiers. If you were thinking, "Man, this game just isn't brutally unforgiving enough," then you're in luck - some observant players have found a slew of difficulty tweaks tucked away in the game's files. Also, you should probably get help. 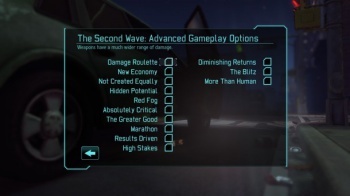 The advanced settings, collectively dubbed "The Second Wave", were part of a feature that developer Firaxis Games had intended to include in the game to boost its longevity. Unlocked after successfully completing the campaign, they would allow players to tweak various aspects of single-player gameplay. The options seem to make the experience a good deal more random, and significantly more difficult for hopeful commanders. Either way, don't get too attached to your troops if you decide to enable these settings. Second Wave itself was cut from the release version of the game due to time constraints, but the menu and its included tweaks seem to be mostly intact within the game's configuration files. A helpful user at the XCOM Nexus page has provided a DIY guide to activate the content, so you can start experimenting with fresh new ways to watch Earth burn. At the time of writing, all but one of the added options are working as intended.